Beth Grafton-Cardwell with the new fruit grading system. The UC Lindcove Research and Extension Center has a new, state-of-the-art fruit grader, which automatically gathers detailed information on individual citrus fruits for California researchers. The machine provides data that has not been available to Lindcove researchers before. Typical fruit grading equipment determines fruit size, count and grade. 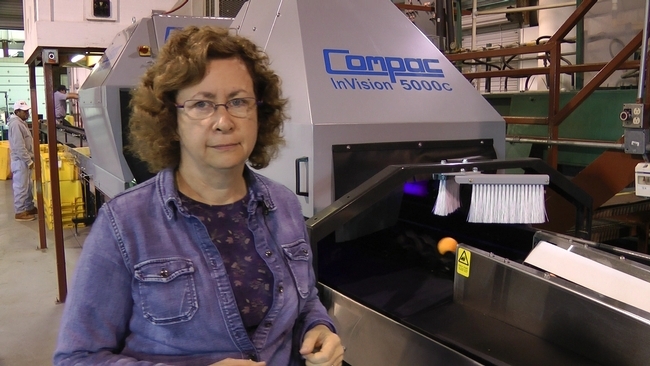 The Compac InVision 5000c has three lighting systems – fluorescent, ultraviolet and near infrared – plus a weigh bridge that together measure fruit dimensions, weight, color, and blemishes from insect damage, scarring and sunburn. Without spoiling the fruit, the grader also determines its sweetness and assesses internal damage. The new line can handle citrus fruit sizes ranging from a small mandarin up to a grapefruit. Highly advanced software works in conjunction with the equipment, recording measurements and a series of photographs – color and ultraviolet – for each individual fruit, allowing scientists to run correlations between all the parameters. In the past, labor costs limited researchers to gathering such detailed information from only a small sample of fruit on certain trees. With the new Compac grader, all the fruit from particular trees can be thoroughly assessed. Another benefit of the upgraded equipment is its light-touch. The machine can gather data about mandarin oranges without harming the delicate peel. Growing interest in mandarins has UC scientists devoting more time and resources to the diminutive fruit. While Valencia and navel orange acreage is holding steady or dropping in California, mandarin acreage has tripled in the last 10 years. The cost of the Compac fruit grader was covered by the Citrus Research Board, a grower-funded organization created to support citrus research. “The new fruit grader is another example of the excellent collaborative relationship the University has with the citrus industry,” Grafton-Cardwell said.